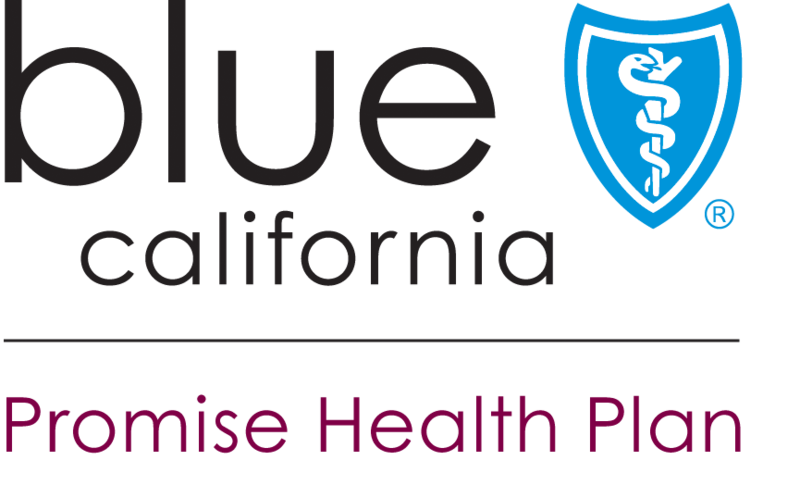 Kaiser Family Foundation (KFF) and California Health Care Foundation (CHCF) released the results of a new poll this month assessing the health care priorities of California Residents. The poll, conducted at the end of 2018, surveyed a random sample of 1,404 California residents over the age of 10. 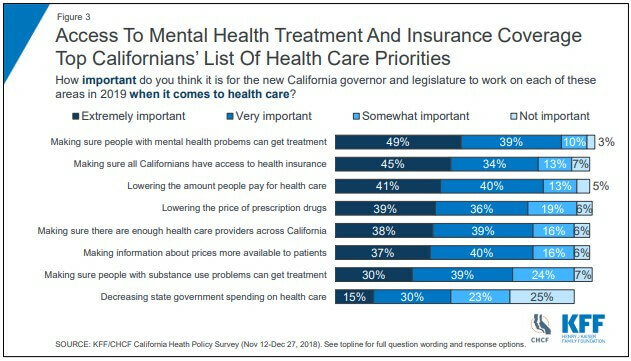 Making health care more affordable ranked as a top issue for most Californians contacted, with 45 percent ranking it as “extremely important” and 35 percent ranking it “very important.” While increasing access to mental health treatment topped the list of specific health care priorities. 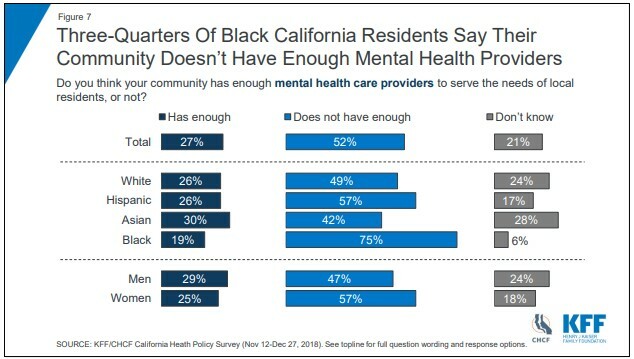 These concerns are likely related to the fact that in all six geographic areas surveyed, residents said that their communities did not have enough mental health providers, with even higher percentages reporting shortages of providers in communities of color. 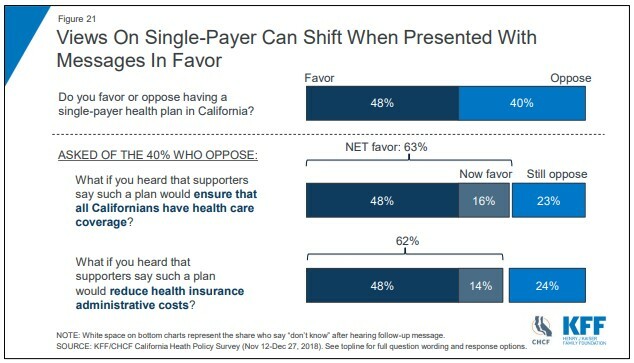 Other interesting findings include that though most residents have a favorable view of Medi-Cal (70 percent) and say that it is important to the state (91 percent), views on extending single-payer coverage are mixed and shift based on how the question is presented. Also, regarding affordability of health care, one out of five residents surveyed reported that someone in their household had problems paying medical bills in the previous twelve months. 31 percent also reported receiving an unexpected medical bill in the past year. 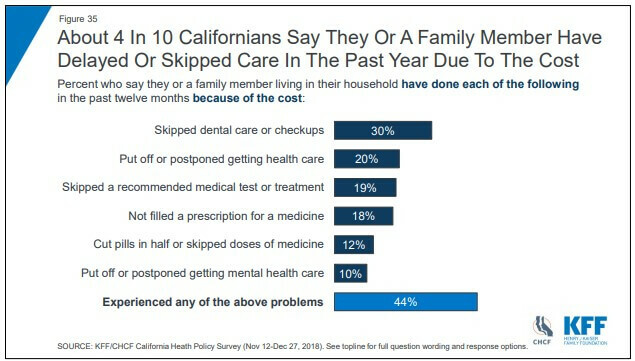 Finally, and perhaps most concerning to overall health outcomes, 44 percent of those asked reported someone in their household had delayed or skipped medical care in the last year because of cost.